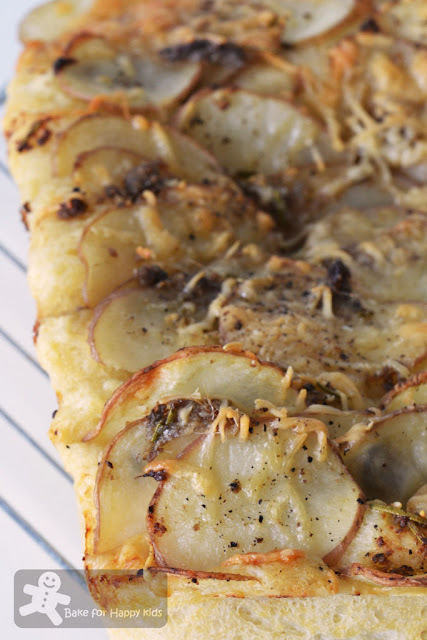 When I first saw this potato focaccia recipe at Epicurious, I know that my family and I will love to eat this. The combination of its toppings sounds very delicious to me. True enough, it is! We really enjoy every aspect of baking and eating this bread... It is very moist, spongy (QQ) and delicious! 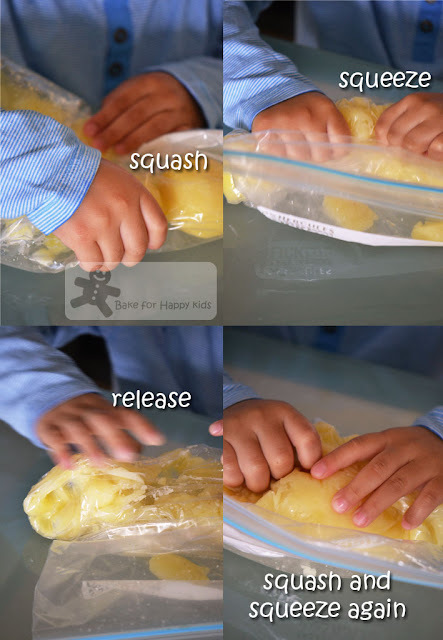 My son's squash-and-squeeze technique of mashing potatoes - LOL! Love everything in this oil mixture - Yum! Ready to feast on this bread? The dough may be made up to this point, punched down, and kept, covered and chilled, overnight. Let the dough return to room temperature before proceeding with the recipe (I didn't chill the dough overnight). 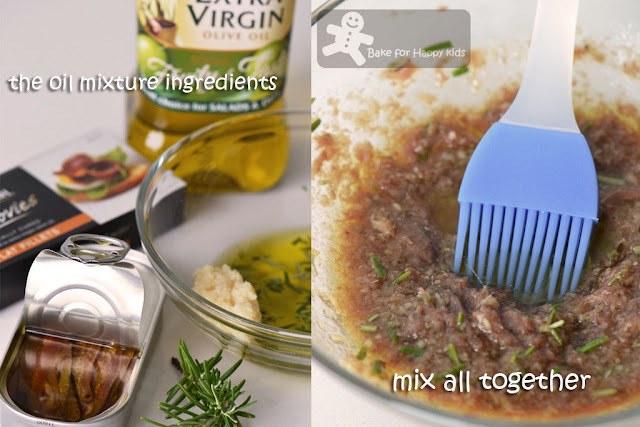 In a small bowl stir together the garlic, the rosemary, the anchovy paste, and the remaining 4 tbsp oil and let the mixture stand, covered. 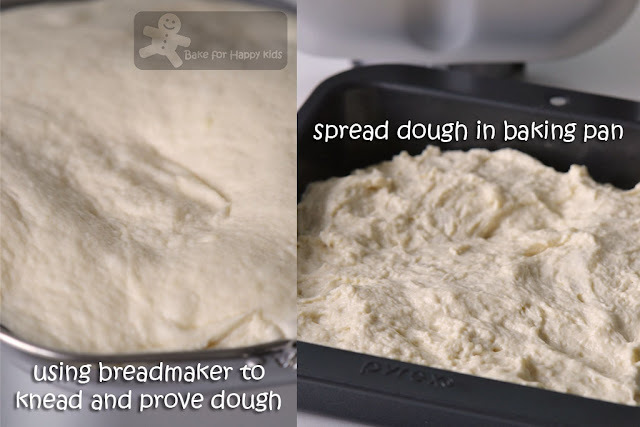 Press the dough evenly into an oiled jelly-roll pan, 15 1/2 by 10 1/2 by 1 inches, and let it rise, covered loosely, in a warm place for 1 hr, or until it is almost double in bulk. 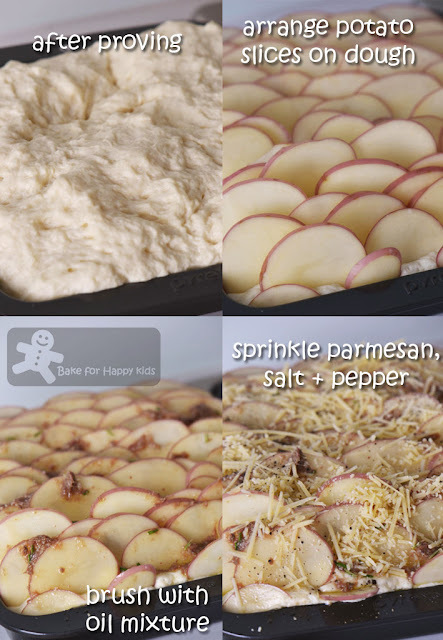 Cut the red potatoes into paper-thin slices with a mandoline or handheld slicer, arrange the slices on the dough, overlapping them, and brush them with the oil mixture, discarding the garlic. Sprinkle the focaccia with the Parmesan, the coarse salt, and pepper to taste. Bake the focaccia in the bottom third of a preheated 400°F. oven for 40 to 50 mins, or until it is golden brown, let it cool in the pan on a rack, and serve it warm or at room temperature. Note: Using half of the recipe, I have baked this bread at 180°C fan forced for 30 mins using 20 cm x 20 cm square pan. The month sure did go hopping by. so cute of your son to be counting the days, lol...Some exciting events for the month of August though. I'm sure they will be tasty and FUN!!! Mmm mmm, I like foccaccia.. Normally would order the ham and cheese (with egg) one.. Common and boring huh.. But yours is different and interesting - anchovies.. I thought it looks like sardines (or tuna) but I bet it taste awesome and gone in a few hours! Hi Zoe, I've bookmarked a focaccia recipe ... but short of some ingredients ... your's just in time for me have a bite ... hee hee ! Yep, looks delicious and inviting! I wish I have a bitter stomach to eat all the baking goodies that I have bookmarked to bake lol! How innovative and delicious!! I've never thought or seen a focaccia like this but I totally would love to try it! Anchovies on bread sounds great! This looks so special and yummy, I could almost smell it from here. And I love your son's way of smashing potato. It's a good way to get the kids involved with the cooking. I shall ask my boys to do that for me next time. 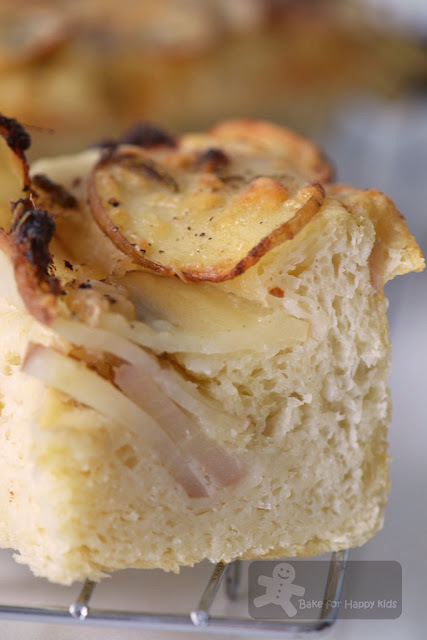 No doubt a very delicious focaccia which has all my favourite ingredients - potato, cheese and anchovy. Yum! This looks wonderful, Zoe. The layering is pretty! 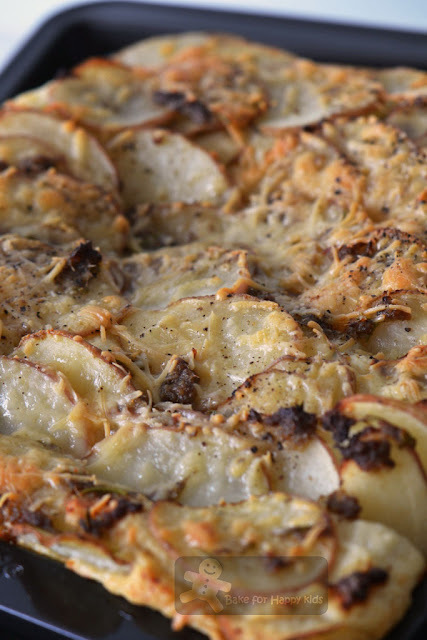 I love potatoes and I love focaccia! This looks like the perfect focaccia for me. I love focaccia and that reminded me that I haven't bake one for a long long time. Oh Zoe, These focacial looks delicious. 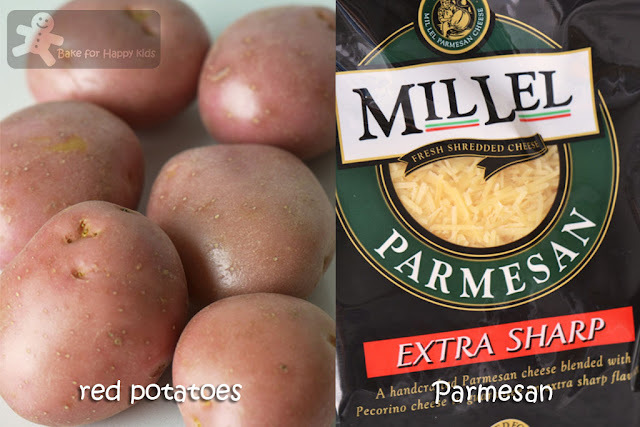 I love love potatoes and I must bookmark this recipe!! This is an interesting Focaccia recipe, looks really good and enticing especially the last photo, wish I can have a bite! Zoe è magnifica questa focaccia e sono certa mio marito la divorerebbe in un solo boccone!!!! Zoe, this is a very special bread. It really looks so yummy and delicious!